To promote and develop professional competence and standards in educational services for linguistically and culturally diverse students in cooperation with teacher training institutions; national, state, and local educational agencies; and professional as well as community organizations. To hold seminars and conferences for the promotion, development, and enhancement of meaningful, effective, and efficient educational services for linguistically and culturally diverse students in Illinois with an emphasis on multilingualism and multiculturalism. Originally, the Illinois Association for Bilingual Education (IABE) was a pioneer affiliate of NABE. It was founded in the early 70′s in response to the need for promoting educational services for potentially English proficient (PEP) students in the State of Illinois. 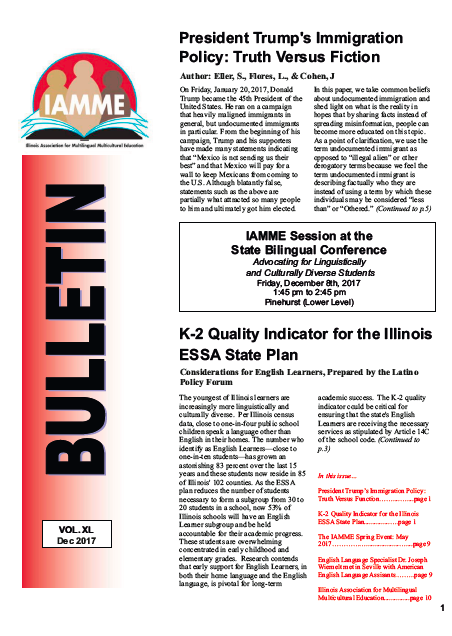 In 1988, in an effort to include all educators involved with linguistically and culturally diverse students, the name was changed to the Illinois Association for Multilingual Multicultural Education (IAMME). The promotion of meaningful, effective, and efficient education for linguistically and culturally diverse students which includes the development of multilingualism and multiculturalism. The promotion of quality educational practices for developing an appreciation for cultural and linguistic diversity in a global society. Click on this link to read a new article titled "The New Bilingualism" from the Atlantic Monthly. © 2014 Illinois Association for Multilingual Multicultural Education. All Rights Reserved.